Microsoft Corp released on Last week a second test version of Internet Explorer 8, delivering a feature-complete upgrade to the world's most widely used Web browser. The world's largest software maker said the latest version -- beta 2 -- of Internet Explorer, which has a market share of about 75 percent, comes with new features to enhance privacy, ease-of-use, and security. Microsoft first released a test -- or beta 1 -- version of IE 8 in March, but that was aimed at letting Web developers take a first look at the new browser. This latest version is aimed at a broader consumer audience. The company would not disclose when it planned to officially launch IE 8 nor how many people are expected to download the test version of the new browser. It released Internet Explorer 7 in October 2006. Microsoft has pledged to deliver more regular updates of Internet Explorer, whose lead has been chipped away by Mozilla's Firefox browser. The latest version of Internet Explorer replicates features found in Firefox 3, the latest version of that Web browser, including a "smart" address bar that remembers and redirects user to website addresses they have visited before. 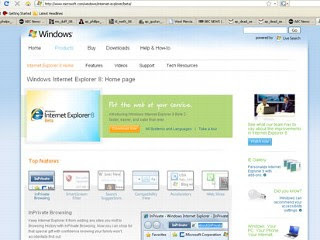 Internet Explorer 8 also offers a mode called "InPrivate Browsing," which ensures that history, temporary Internet files and cookies are not recorded on a user's PC. There is also a security feature that allows a user to block content coming from third-parties trying to track and aggregate the user's online behavior. Microsoft also updated already announced features such as "Activities," which allows a user to use information found on one page, such as an address, in conjunction with an online service such as mapping without leaving the original site. The latest test release of Internet Explorer 8 is available for download at www.microsoft.com/ie8.